A Mamet play is all about the language. Everything you need to know is right there in the half sentences and blustering speeches, the interruptions, the curses, that strange combination of grandiosity and hyper-realism. 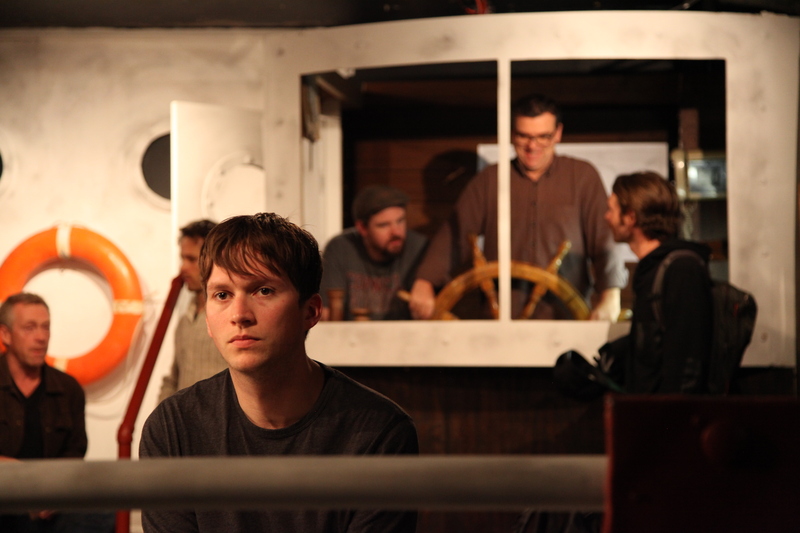 In the slice-of-life one-act Lakeboat– with the exception of Stephen Macdonald, whose leading performance as a sensitive recruit is marked far more by his nuanced reactions than anything he says- the impact each character makes depends on how comfortably the actor sinks into Mamet’s linguistic world. Designer Adam Belanger has transformed the intimate Unit 102 theatre into a remarkably detailed ship that envelopes every inch of the space to the point where the bathroom at the back of the lobby doubles as a galley. The set has useful levels on which director Scott Walker fills out the world of the play beyond whatever two-handed conversation is the central focus- Skippy (Jamie Johnson) looks out omnipresently from the upstage helm and Fireman (Jesse Ryder Hughes) sits with his back to the audience, reading to break up the monotony of supervising gauges. Ultimately, the production intermittently floats or flies depending on the effectiveness of the man carrying the speech in any given moment. Though the pace is thankfully kept up, most of the cast struggles to make Mamet’s intensely specific dialogue sound natural, giving the play’s rough-edged sailors a strange perform-y sheen. The exception is Mark Paci who plays the intense Freddy with such lived-in naturalism and thrilling focus that he disappears into the charming, dangerous, bombastic character every moment he’s on the stage. It’s a star turn that dramatically elevates the production, giving Lakeboat real power when it otherwise merely floats. In: Indie Theatre, Mamet, One-Acts, Reviews, Theatre Reviews, Toronto, Unit 102 Actors Co.